Composite lumber is an interesting and unique way to update and decorate your home. Composite lumber is made by combining real wood with plastic materials. This creates a natural wood look that’s able to hold up to the elements very well. This is ideal for outdoor decorating in areas that are open to snow, rain, and wind, which can strip down natural wood over time. Many deck floors and sidings are made with composite lumber as well, and a composite lumber handrail matches that look better than natural wood, which can feel unfinished when next to composite lumber. 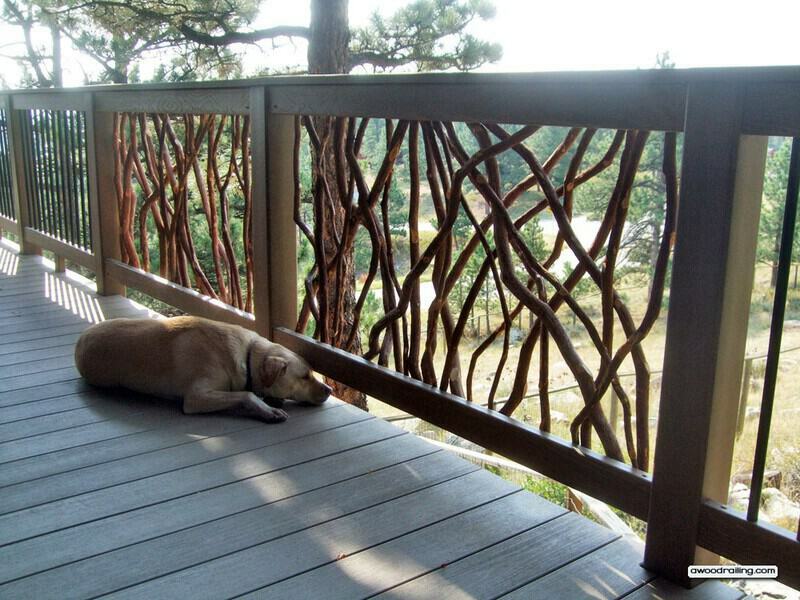 This Mountain Laurel Handrail was built with composite lumber to match the composite decking on this beautiful deck located in Boulder, Colorado. The product used was Tamko Evergrain 2×4 in the Weatherwood color. 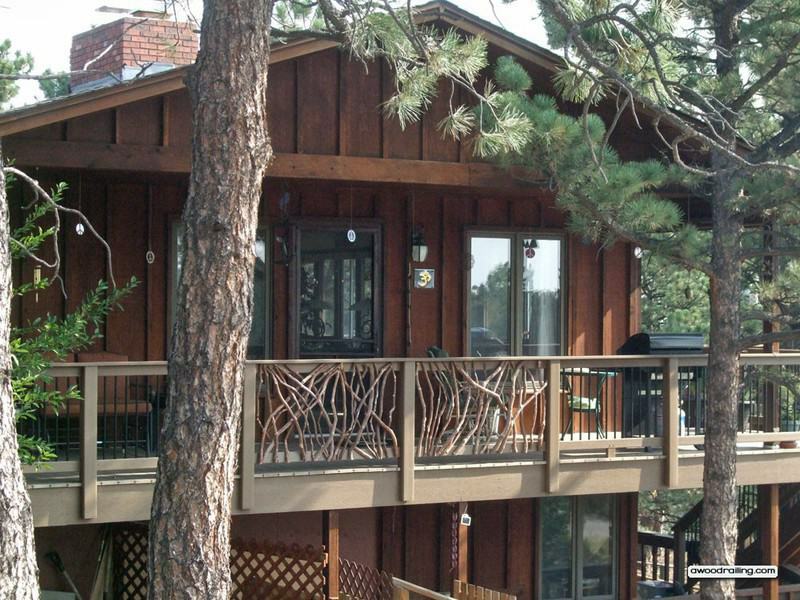 The homeowners used Mountain Laurel Handrail as an accent piece to complement their metal baluster railing. An exciting visual look is created by combining different materials in this way. My apologies for not sending some pictures sooner. My wife is also working on getting a good picture of the gate and I will forward that when I get it. We love the railings and have received many compliments on them. 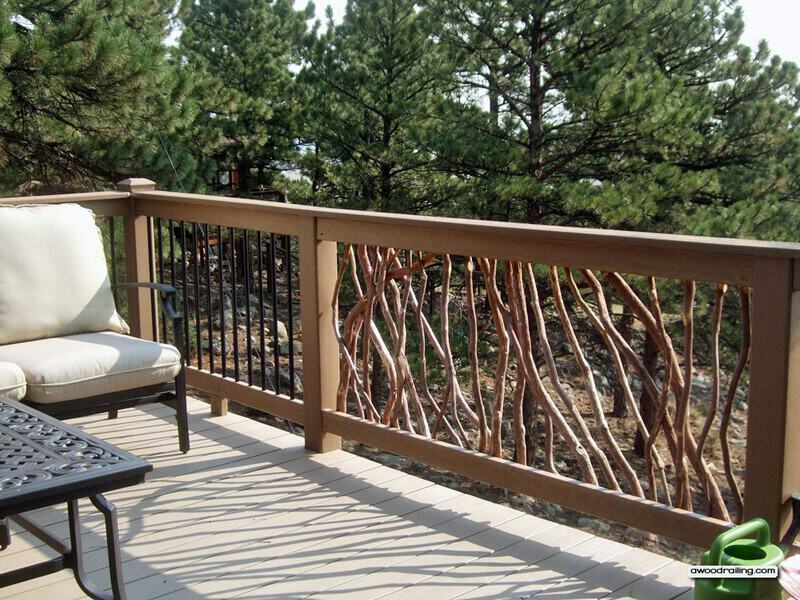 As we can see from this photo, the metal handrails work nicely with the feeling of the home, but the Mountain Laurel Handrails really bring in the nature beyond and give a feeling of that nature coming into your home and your deck. 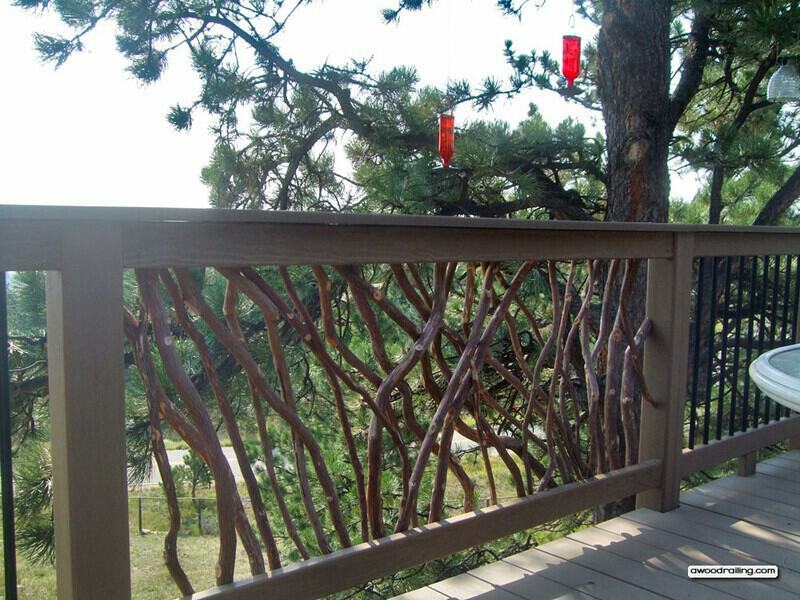 The use of composite lumber really helps to bring it all together into a beautiful, cohesive deck and handrailing. 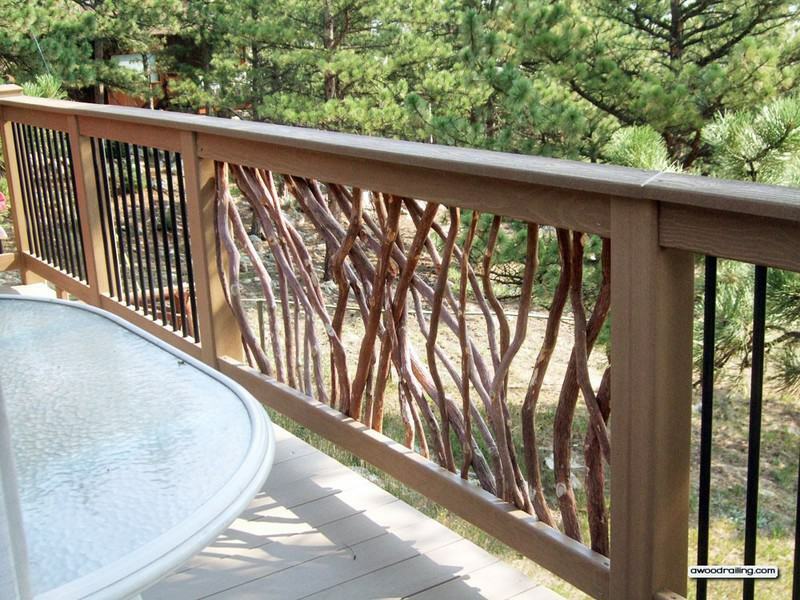 One of the unique elements of Mountain Laurel Handrails outdoors on decks is the shadows created. This picture clearly shows the difference between the shadows from the metal and the wood handrails. While the metal handrails give off very nice uniform shadows, the wooden Mountain Laurel Handrails give a much more natural shadow, which you might actually see in a forest or park. The composite lumber is able to bring these two contrasting elements together nicely. This deck has a unique mix of metal and composite lumber, which is very eye-catching. 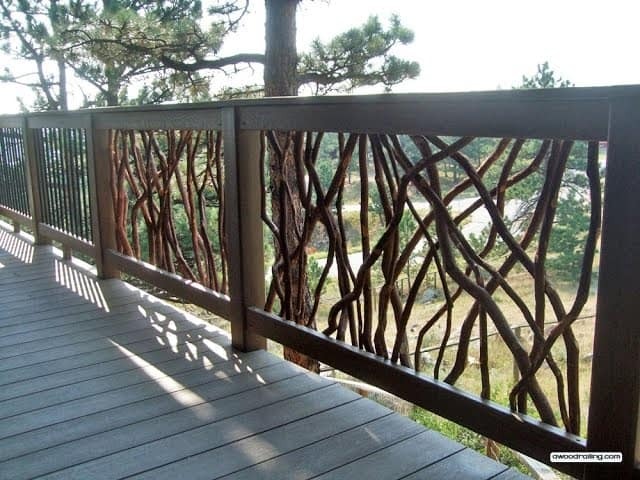 The straight black metal contrasts the intertwined, natural-looking branches from Mountain Laurel Handrails. This is sure to be a conversation piece as well as provide a beautiful home for the family living here. Mountain Laurel Handrails made with composite lumber don’t only look good from the inside of the deck. They create a unique eye-catching look from the outside as well. You’re sure to attract many admirers with these handrails!